An office desk is where you spend nearly half of your day. And today everyone wants a workstation that is both elegant and comfortable. The selection of an office desk is always a critical task and it is undeniably important to choose the right one. While selecting a desk, you must consider the style & design that matches the decor of your office. Today, offices have a theme and a different style to create a magical atmosphere in the workplace. Modern work desks are built for those who needs something to suit their style and make their jobs as easy as possible. If you have no room to organize your office, choose a versatile office desk that gives you flexibility to create different room layouts effortlessly. They have a storage space to keep your documents well organized and are perfect for less space. Easy to install, easy to rearrange, and easy to store when not in use. A modern office desk not only speaks about style, but also speaks of its functionality. It brings warmth & sophistication into any office. It often comes with sleek designs and solid structure. The shelves and drawers are either displayed or hidden in the folds – saving space and looking beautiful at the same time. Modern office tables are ergonomically designed to provide maximum comfort for you. 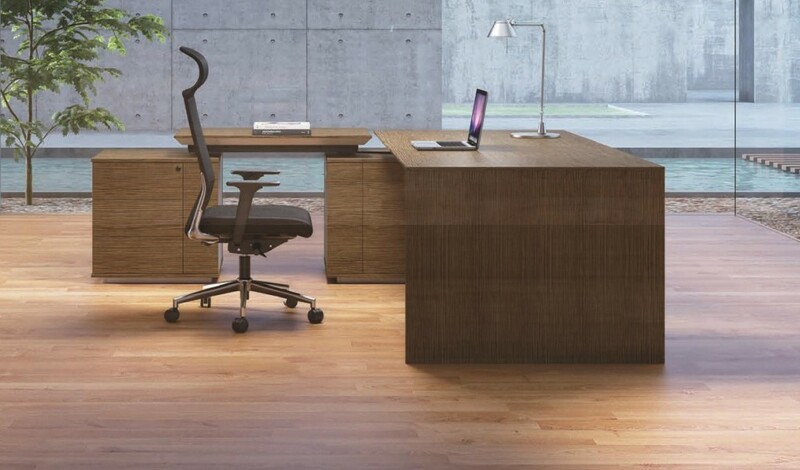 Stand out from the crowd with Boss’s Cabin office desks. With an elegant yet classy touch, a traditional office desk is still considered the best. Not only it has a beautiful design, but its simplicity makes it stand out among the others. Multiple drawers on one side, a keyboard tray and a cabinet make this an ideal choice for your office. A contemporary desk is a useful & multifunctional addition to any office space. It is an elegant desk which creates classy appeal in the workspace and keeps your office stuff look well maintained. A positive atmosphere can be readily created by using it, making working pleasurable. This will increase the working efficiency and productivity of the employees. Today, many styles and metals are available. So, you can also get a custom made unit according to your preferences. An adjustable desk has a mechanism for modifying the height. It lets you increase or decrease the height of the desk at any time. It is a comfortable desk and ideal for people who like to work both ways, standing and sitting. Its configuration is also helpful if you manage a large group of people in a workplace. Now, each employee can adjust their desk to their desired working height. An executive desk is a classic desk that keeps professional going at work. It has a simple but elegant design and structure with multiple drawers and shelves to keep your work essentials organized and secure. The engraved wood conveys a sense of luxuriousness and timeless demand that makes them special from other designs and styles. Usually it also has a plug-n-play ports, which gives the whole unit a systematic look. An L-shaped desk saves a lot of space in terms of organization of books, files, stationery and everything needed for the job. It also keeps all your essentials on a single desk. It not only has a large desk top but, also has several drawers and open shelves to keep your work necessities in order. Often times the desk is preconfigured with the return on either the left or right side. This type of desk can be of any style and usually looks good with bright colors. These are vibrant desks lift your mood and make you happy all day. You can also customize the desk with dynamic objects and materials. With rapidly changing furniture trends, it is always better to keep an eye on comfortable desk designs and additional features that can make you work efficiently and comfortably; and increases your productivity. The best desk can lessen your stress levels, and can help prevent injuries. That is why it is important to choose the best and comfortable office desk for your office needs.